Michelle Young's impressive debut novel, Dragonstone, hits all the notes that a fantasy/romance novel should: strong women, gorgeous men, lovely scenery and life-altering adventure. However, this ain't your mother's romance novel. 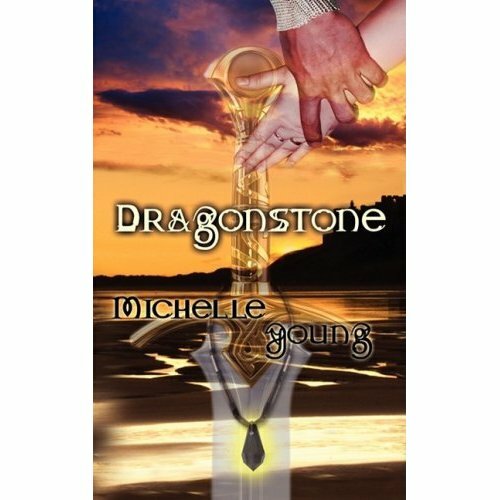 With Dragonstone, Ms. Young has created her own niche in the fantasy genre, imagining a world where "magic rules the land, dragons roam the skies, and everyone has their secrets." The reader is transported to the world of Latharia, where Lady Katerina must fulfill the prophecy of defeating the Black magic that is threatening to overtake her land. Because her magic was "awakened" by an act of violence, her Dragonstone, which holds all of her magic power, turns Black. Not wanting to use her magic because of evilness that controls the Black Dragonstone, she rids herself of her Dragonstone, determined to rely on powers that she can control and develop herself. After a three-year absence from her kingdom (where Katerina trained and honed her own skills), she returns to Latharia to find that forces with not-so-good intentions do not want her to inherit her rightful place in her kingdom. With the help of a mysterious (and of course, breathtakingly attractive) personal guard, Katerina must retrieve her Dragonstone and defeat the evil forces who would prefer to reign with evil Black magic. Young’s new novel, The Dragon’s Heart, picks up nearly 25 years later, with Katerina’s daughter, Syrena, fated to continue her mother’s quest to rid Latharia of black magic and defeat the evil Kyron once and for all. In order to fulfill her destiny, she must learn to harness her beast-master magic to help her save her kingdom, all the while trying to gauge if the mysterious Blaze is someone she can trust, or if he has an agenda of his own. While I normally would not consider myself a fan of the traditional fantasy/romance book, I was pleasantly surprised and captivated by Ms. Young's books. They are fast-paced and intriguing, keeping the reader on the edge of her seat for each book. In fact, this series made me reconsider the entire fantasy/romance genre in general. Dragonstone and The Dragon's Heart is a compelling epic-fantasy series about lies, love and letting go. It's a must-read series, no matter what genre you prefer. And I guarantee that after you read these books, this will be a genre that you will prefer.